This is a fun keepsake to help students and teachers remember their class from a specific school year. Teachers survey the students for their favorite book title and author from the year. This is also a project your class room parent can handle by sending a Group Email to all of the parents asking them to send one of their child’s favorite book names from the year. Once all of the book titles are collected, create a list of the student names with their book selections in a Word document (landscape orientation, 3 column set-up). You can also insert a class picture if you have any spare white space. Your list should not exceed two columns in the Word document. After printing, cut the lists into two strips and paste them onto 9×4 in. construction paper strips (front and back). 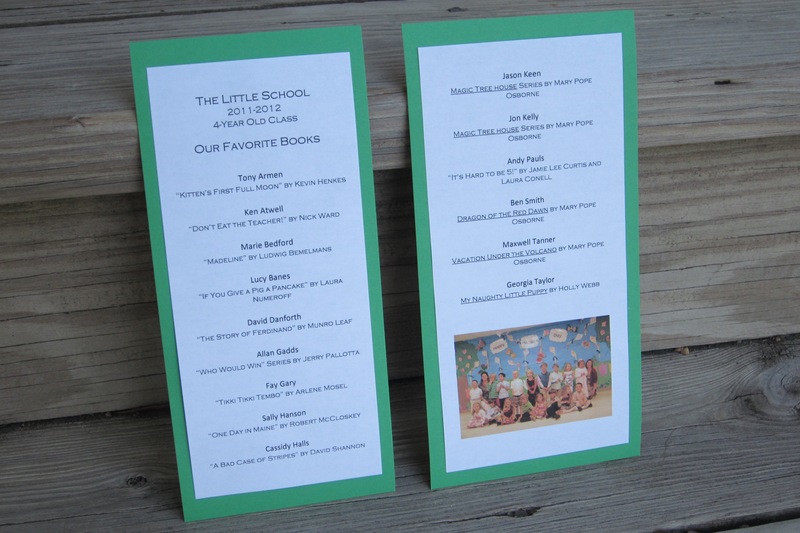 Then, run the assembled bookmark through the laminating machine. I love love love this idea…I wish I had seen this when my kiddo was in elementary school because it would have made the perfect end of year gift for his classmates and teacher. I’ve shared this link with a super duper room mom friend with younger kids.